More than 76 percent of Americans subscribe to a religion or system of spirituality, yet research suggests that college students are more likely to struggle with keeping their faith than any other demographic. Students interested in learning about this pivotal time can use this guide to find campus resources, understand challenges, and review religious and spiritual demographics in college. Anne Klaeysen is a leader of the New York Society for Ethical Culture. She holds a Doctor of Ministry degree in pastor counseling from Hebrew Union College, as well as master’s degrees in German from the State University of NY at Albany and business administration from New York University. Dr. Klaeysen is the Ethical Humanist Religious Life Adviser at Columbia University and Humanist Chaplain at NYU. She is also co-dean of The Humanist Institute and serves on the board of Sunday Assembly NYC. Dr. Klaeysen participates in several interfaith social justice coalitions. Regardless of religious beliefs, today’s college students have many groups and resources available to help them find a community and embrace their faith at the postsecondary level. Whether becoming an active member of a local religious group or taking part in a student organization, the following section highlights some of the common challenges faced by religious students and outlines ways to ensure the transition to a new environment doesn’t mean they lose touch with their beliefs. While there are many private Christian institutions peppered throughout America, some students may elect to go to a secular school while still living out their faith. While there may not be as many readily available opportunities at these institutions, plenty of opportunities exist. Aside from organized groups, students may also feel they are lacking spiritual mentorship or a scholarly voice on religion. Regardless of their degree, students should see if their institution has a school of religion, as these departments may allow professors or students to host religious services throughout the week. One of the biggest challenges for Christian students can be finding a community as robust as the one they left behind. Joining a local church allows students to be part of weekly bible studies, find a spiritual mentor, and meet other college-aged students who are serious about their faith. With the majority of Jewish individuals attending college (58 percent), incorporating faith into busy college schedules is an important part of the academic experience. Because practicing Jews must reserve the Sabbath for rest, learning how to manage a busy workload early in their college career is paramount. Compounded with other Jewish holidays or observances, students of this faith should ensure their institution’s office of academic affairs has policies in place allowing students to participate in important religious days without penalty. Jewish students should also check with their college’s dining services to ensure there are plenty of Halal and kosher items offered. While this shouldn’t be a problem at the vast majority of campuses, it’s worth looking into before signing up for four years. Boston College provides a helpful FAQ section of some of the most common questions Jewish students may have when selecting a school. 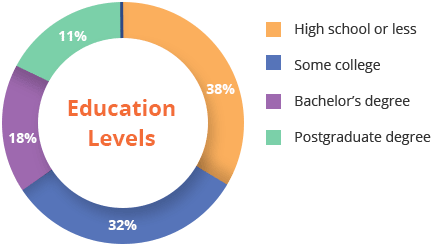 Followers of Hinduism represent the largest group of educated religious students, with nearly eight out of 10 holding at least a bachelor’s degree. With such a large concentration of Hindu students on today’s campuses, many colleges have risen to the challenge of providing resources specific to followers. Because meditation and yoga are both essential components of Hinduism, practicing students should speak with any prospective schools to find out if outlets for these activities exist. Aside from student associations, meditation and yoga groups are a great outlet for making like-minded friends. Additionally, both activities have been shown to reduce stress and help students cope with busy schedules, so many universities have created opportunities throughout the week for students to participate in meditation and yoga sessions. Princeton University’s Hindu Satsangam provides an example of some of the meditation offerings schools may provide. Differing from more prescriptive religions, Buddhism is focused on helping its followers achieve enlightenment through meditation, positive mantras and designing a practice that works for their individual lives. Although meditation can be a solitary pursuit, it can also take place in group settings. For Buddhist students who seek communal meditation or other events related to mindfulness, they should research prospective schools to find out what they offer. Many institutions provide meditation series to help students alleviate stress. The University of Virginia operates a Contemplative Science Center that offers three wellness dorms, events and activities related to mindfulness, and meditation sessions to reduce stress. Though there aren’t as many Buddhist student organizations operating at the national level, a number of schools have local or individual associations. One of the largest groups is Soka Gakkai International, which provides retreats, regular gatherings, opportunities for fellowship, and guided meditation. Some students may also face a challenge to fit their practice in with all the other academic and personal responsibilities. In an article for the Chapman University blog, one student outlined the 10 things she loved best about practicing Buddhism in college, and how she fits faith into her daily routine. A tradition very closely tied to ideas of family and community, Greek Orthodox students looking to build their own religious community once they reach college have many resources and opportunities at their fingertips. Rather than creating large national groups, Greek Orthodox communities tend to prefer providing opportunities for students out of the local diocese. Once reaching college, students should check with their school’s chaplain or research the local parish and meet with the spiritual leader to learn about getting involved. One exception to the local rule is The Orthodox Christian Fellowship, a large group which spans the country and offers Greek Orthodox students the opportunity to meet like-minded students, participate in faith-based discussions, go on domestic and international service projects, and receive lay or clergy training. Although students may be nervous to make the transition from their home parish into an unfamiliar setting, they need not worry. Churches place great emphasis on encouraging students in their faith, setting aside 40 days in August and September to focus on their transitions to postsecondary institutions and ensure they are well-connected. In a series of interviews shared by Huffington Post, a group of Muslim college students spoke about what college is like for them, and some of the common challenges they face along the way. With much misunderstanding surrounding Islam, these students are often focused on ensuring those around them understand their beliefs. Another challenge Muslim students encounter is communicating about their religion so that they aren’t discriminated against. Interfaith student councils are a great resource for individuals looking to create greater understanding and awareness of Islam’s tenets of faith, as these groups encourage diversity and dialogue on world religions. Florida State University offers a glimpse of an active interfaith council at work. Lastly, Muslim students must eat Halal foods, so finding a school with suitable options both on-campus and nearby is of great importance. Wichita State University provides a great example of how schools can help their Muslim students find food suited to their dietary needs. Although many students may come to college as an agnostic, still more may gravitate toward these beliefs during their education. College is a time of questioning previously held ideas and being asked to substantiate assumptions. For many, this exploration of faith can cause them to research other religions or move away from it entirely – either temporarily or permanently. Because many colleges – particularly private institutions – are religious, secular students can sometimes feel neglected or marginalized. While more religious institutions are officially recognizing agnostic or atheist student groups, some still deny groups outside the university’s official beliefs. If a secular student still wants to go to a religiously affiliated institution, seeking out a local community group may be their best bet. Meetup currently hosts 718 agnostic groups with more than 240,000 members. Students who are trying to reconcile previously held ideas with what they are learning in college often benefit from becoming active participants in their school’s interfaith council, which allows them to explore religion from many different angles. Students should research prospective school to find out if such a group exists. I think it's more important that college students take advantage of the wonderful opportunity they have to meet people from different backgrounds and faiths and to learn from them. College is a place to discuss one's beliefs with others – and to have them challenged; it is, after all, an institution of higher learning. Anne Klaeysen, Leader for the New York Society for Ethical Culture. College is often the first setting where students live their beliefs away from their families, observing protocols and celebrating traditions throughout the year. The first year for students can be especially challenging as they are still developing a core group of friends and trying to find where they belong. Because religions are built on the idea of community, finding a welcoming space to celebrate and observe beliefs is a key component of success, especially when it comes to the following challenges. College is a time for exploring ideas outside your own and learning how to live as an adult, away from the watchful eye of a parent or guardian. For many students, this setting is the first time they’ve lived out their faith without encouragement from their family, and it takes time to find the balance between responsibility and accountability in the face of newfound freedoms. Whether following the tenets of Lent or observing Ramadan, religious students have certain commitments throughout the year. Many colleges celebrate the diversity of their student body and have policies to ensure no student is ever penalized for missing class for a religious observance. Most of these policies and on-campus activities are presided over by groups such as the Interfaith Council, which is typically a student led organization that represents the interests of varied religious groups. Individual religious student groups are also becoming a mainstay of most academic campuses, with additional support coming from outside organizations like FIRE, the Foundation for Individual Rights in Education. Students who are stringent in their beliefs may struggle with the college party scene, particularly if they attend a raucous school known for tailgating, an active nightlife, or Panhellenic – Greek sororities and fraternities – activities. Depending on the student’s individual beliefs, these experiences can either be a time of exploring what they are comfortable with and finding friendships outside their usual circle, or something they choose to avoid. College means interacting with different cultures, belief systems and viewpoints, and for many students these new and different perspectives play a part in their dating life. Those who identify as strongly religious may struggle against the idea of being in a relationship with someone who holds different spiritual ideas, while others may view it as an opportunity to expand their worldview. Whether open to an interfaith relationship or committed to dating within the faith, students come face-to-face with this decision. For some it is a personal choice, while others may feel familial pressure to uphold certain religious and faith-based traditions. Students from religious traditions that stipulate certain garments or physical appearances may struggle to create identities outside of their religions, especially at colleges with a predominant religion outside of their own. Recent years have seen many cases of academic institutions disciplining faculty and students or banning religious apparel – such as the hijab or burka – only to reverse their decision after backlash. The majority of religious students are accustomed to having a spiritual community prior to leaving for college, so navigating a new experience while also trying to maintain faith often leaves new college students feeling frazzled. College students are called upon to debate ideas and have their assumptions challenged, be they religious or otherwise. For those who have held an exclusivist viewpoint until college, these exercises can leave them feeling shaky in their faith or provide an opportunity to solidify their beliefs. With social commitments, academic deadlines, work duties, and family responsibilities, finding time to participate in religious activities on a weekly or bi-weekly basis can seem impossible. Many students may struggle to maintain an active spiritual life amidst pressures to place it behind other obligations. In addition to weekly services or other spiritual responsibilities, the hallmark of many faiths is providing service to others. Whether showing kindness to a roommate or serving up soup at a local homeless shelter, these activities – often encouraged by religious tenets – can be hard to maintain alongside other responsibilities. Throughout their time in college, students will constantly face questions about what they believe and why, and be asked to think critically about all the opinions they hold, religious or otherwise. It is up to the student to decide if they believe due to their upbringing or because of a closely held faith. Some students may stay the course throughout their educations while others will change their beliefs completely. Why do you think it's important for college students to remain steadfast in their religious/spiritual beliefs? Presumably, a student has a choice of which educational institution to attend and goes through a process with her or his parents to select one that matches course offerings to future goals. If one of those goals is to remain steadfast in one's beliefs, there are many excellent sectarian colleges. But even seminaries seek to challenge students so that they can better understand their faiths. Many years ago, I had a choice between St. Rose, a Catholic college for women, and the State University of New York at Albany, a secular institution. I convinced my parents that the latter was the better financial deal. Being the first of four children, all of whom they hoped to send to college, this made sense, but they were concerned until my uncle, a Catholic priest, reassured them that there was a Newman Club on campus. Frankly, my choice had more to do with the diversity I saw at SUNYA. I grew up in a small, homogeneous village where a mixed marriage was the one between my Irish Catholic mother and Dutch Reformed father. I longed for a different environment and found an enriching one on the secular campus with the activist priest. I also took a comparative religion class. Years later, I married a Jewish student I met there. We had a Humanist wedding ceremony and raised our two children at the Brooklyn Society for Ethical Culture, where they participated in Children's Sunday Assembly. An important part of the curriculum is comparative religion. From an early age, they visited meeting houses of other faiths and learned what other people believe and how they behave. It was a wonderful preparation for college. Our son majored in religion at the University of Rochester; our daughter in psychology at Carnegie Mellon. Both remain Ethical Humanists. What are some common challenges college students face on-campus in relation to maintaining their religion/spirituality and "fitting in" to the traditional college environment? The challenge, in my experience, comes from students being too fearful and rigid to take in all the wonder and awe around them. Each college has its own tradition, something that can be researched before matriculating. Campus visits are essential; they provide opportunities for conversations with students and faculty. The campuses I serve as chaplain, Columbia and New York Universities in Manhattan, take great care with their tours and orientations. Their goal is less about students fitting into their traditions than about meeting the needs of their students, and that includes their spiritual and religious needs. We chaplains and religious life advisers are on hand at campus orientations; our contact information is posted online; and we work together in interfaith settings, as well as with campus wellness and counseling centers. A workshop offered at NYU called Faith Zone is especially helpful in opening up the conversation about beliefs. It is an award-winning program that is being replicated on other campuses. To remain steadfast in one's beliefs, one must study them, and chaplains are available to conduct study groups. It is through deep understanding of one's beliefs, their origins and practices, that students can confidently remain in their religious communities. Do you have any advice for college students who would like to seek religious/spiritual services on campus? Seek out the interfaith center when you visit campuses and talk with the chaplains. On orientation day, stop by the chaplaincy table and pick up literature; there's usually also a lot of swag there, so pick up the pens, water bottles, and bracelets, too. Go online to find contact information for the chaplains, the times and venues for religious services, and the names of student religious clubs. Visit all of the chaplains on campus, not just the ones from your own faith. You will learn so much, and we have all been trained in pastoral counseling. I recently met with a Mormon student who was preparing to return home to Utah for the holidays. Her faith had been challenged, not by other students, but by her church's discrimination against the children of LGBTQ parents. My role was to listen and reflect back what I heard her say so that she could better connect with her thoughts and feelings. Attend interfaith gatherings, e.g., common meals. Sadly, interfaith vigils take place often these days. Recently I have mourned with my Muslim colleagues the murders of and attacks on their students. My interfaith work over the years has both reinforced my humanist faith and given me great respect for other faiths, especially in the field of social justice, where we share much common ground. In Ethical Culture we talk about putting deed above creed. Belief is important, but only when it motivates and supports ethical action. Some religions have higher concentrations of college-aged followers than others, as demonstrated below. This table also shows the median age for each religion. Being a college student means putting in long hours of studying, attending class and completing assignments, all the while trying to balance a social life and possibly a job. In the midst of so many responsibilities, incorporating beliefs can sometimes feel like the tipping point. While it may seem daunting at first, the following list highlights some of the best ways to life out various beliefs in a way that fits into everyday life. When waking, set a positive tone for the day to help stay motivated and focused. Take time for a few intentional breaths and a quick meditation before getting out of bed. Focus on keeping an altruistic heart and being kind to those around you. Learn a mantra, scripture or verse and recite it to yourself throughout the day. Use morning routines like showering or brushing your teeth to meditate and be intentional on the task at hand. Read a few verses of the sacred text of your faith before bed. Find a prayer app or newsletter to remind you to pray daily. Attend a weekly religious service or gathering. Eat foods condoned by your faith. Listen to podcasts on your way to/from class or while taking care of errands that relate to your faith. Pray before your meals, even silently. Take time to recognize the reason for certain religious holidays. Outside of individuals who subscribe to certain religious or spiritual beliefs, there is also a growing body of Americans who are unaffiliated with any belief system. With a growing belief that college is often the time when students lose whatever faith they have, it is particularly interesting to review data on how educational attainment affects belief systems. In addition to sororities and fraternities serving traditional purposes, a number of Panhellenic groups with a focus on religion and spirituality are also active on campuses across the nation. Some of the more well-known organizations are listed below, along with their religious affiliations.